We are often taught about eating etiquettes or a certain acceptable behavior in society. Being the father to a 15 month old toddler keeps me on high alert about my own example. Have I consistently displayed the behavior that I would like my children to imitate. Well, when it comes to driving, I see unacceptable or unavoidable behavior everyday. When I drive my family out for any event and the moment someone cuts me it gives me the heebie jeebies (for lack of a better word for it). Its always a mad rush to get from point A to point B. It actually drowns the pleasure out of driving ! If many of these reckless motorists were actually kids, we could sit them down and explain that driving without any courtesy, rules or respect is down right rude behavior ! By and large, I've been thinking about how to mend my own ways which has been influenced over the years by driving among fellow citizens who have to meekly go with the flow or get over taken. 1. Most Indians are not familiar with the concept of defensive driving taught in the west. 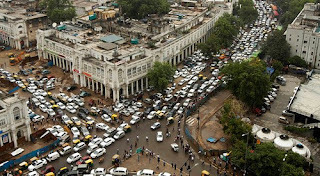 Driving India Blog - Driver education covering all aspects of defensive driving. Image courtesy neontommy which attributes Flickr / Creative Commons License (license type omitted).